Obituary – Dauman, Marvin George « Perry High School Alumni Association, Inc.
﻿- age 18, son of Mr. and Mrs. Frank Dauman, was born on October 20, 1922, at Perry, and attended the Hempfling school before enrolling here. 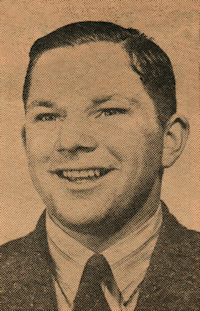 He was co-captain of the 1940-41 Maroon football squad having finished his fourth year in that sport during the last season. He has attended the Perry schools for four years. Marvin lists fishing, hunting and swimming as his favorite pastime. He plans to enlist in the navy, upon graduation. Double funeral services were held at 10 a.m. Monday at the St. Rose of Lima Catholic church for Marvin Dauman and Leonard “Jack” Schurkens, Perry youths who died Saturday morning near Ponca City in an automobile accident. Dorothy Jean Dale, 16, and Ada Robison, 16, also perished in the accident. Burial for Dauman and Schurkens was in the Catholic cemetery under joint direction of the Newton and Davis funeral homes. Father William Reid officiated. Marvin, age 19, was the son of Mr. and Mrs. Frank Dauman, and was born October 20, 1922, in Perry. Marvin was well-known in Perry, having been co-captain of the high school football team during the 1940-41 season. He was outstanding in sports and was a popular student. Although he had originally planned to enlist in the navy, Marvin had attempted to enlist in the marines more than a month ago. He graduated with the class of 1941. Survivors include his mother and father of south Perry; one brother, Gene, of Perry; and a sister Rita Barbara of the home.